We’d love your help. 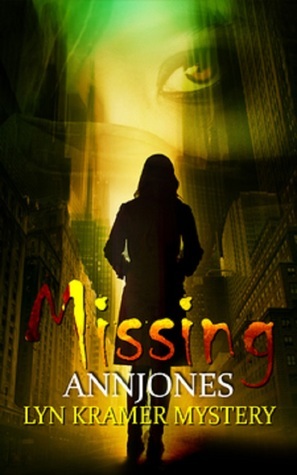 Let us know what’s wrong with this preview of Missing by Ann Jones. Detective Lyn Kramer is busy training Jud Hughes, a new detective on the force, when Gary Farnsworth shows up to report his wife missing. As the interview progresses, Lyn realizes the missing woman is none other than her own twin sister, Melissa. Lyn and Melissa have not seen each other since their parents died twenty-five years ago, when the g Victim? Runaway? Or Criminal? To ask other readers questions about Missing, please sign up. I loved reading this book! Now, I want to know when the second book is coming out?? You have left it open, Ms. Jones, for a continuation of their story. Can't wait! I connected with the author a few months ago and liked the summary of her book. While it was free, I downloaded it, knowing I liked mystery series and would want to give it a try. In a quest to close on all open items on my TBR before January 2018 finishes, I read this one on a plane ride home from a Christmas trip to visit family. And I'm glad I did; it's got lots of potential. Detective Lyn Kramer, ~32ish, works in a small town training her newest junior detective, who happens to be a few years older than her. There's a spark between them, but she's ignoring it while she's trying to end another dead-end relationship. When a missing persons case is dropped on her at the last minute, she gets quite a surprise as the woman is her dead ringer. We later learn it's her twin sister, and they were separated at a young age when their parents died of a drug overdose. There's a lot more going on in this story, connected to her family's past in the mob, and her grandfather's hatred for his in-laws. As Lyn searches for her sister, she confronts a past that tormented her family, slowly learning the truth of what happened all those years ago. This is a novella, on the shorter side of the scale, but it's a good entry point for a new series. It gives the reader an opportunity over a ~2 hour period to decide if the characters, setting and voice work for their personal style. I read on my iPad through Kindle Reader. Besides the author being an absolutely wonderful person from a few chats we've had, the book series is quite promising. I was engaged by the plot and the mystery. I liked the family drama aspects of the story. I found the relationships quite curious, especially how Lyn treats her current boyfriend (or he treats her - yikes!) and what could happen with Jud, her new partner. The writing is clean and easy to digest, presents a picture, but lets you add your own imagination to some of the setting. The suspense factor began building in various chapters. For a debut, I think this could turn into something that I look forward to reading as each new book is launched. Kudos to Ann Jones for delivering a strong first book that has all the elements of a fine mystery series. There were a few areas that were a bit vague or open-ended, and the full background seems to be missing (no pun intended!) a few important details, but I'm not going to question it right now... as sometimes that's the point in a mystery series. You can't reveal everything all at once, so those details will pop up when necessary in future books, I suspect. Twins makes things fun. A girl raised by her grandfather will add a different layer to the story. And Lyn has edge... so this was a good read for me. I will definitely continue with this series. For a debut, it has a lot of promise to deliver quality stories with memorable characters. We've gotten a small flavor for a handful and I look forward to seeing how it progresses. Let me begin by saying this is a very short read. It's also very fast paced and there's a lot going on! But this fast style went well with the overall story. It's just an uncomplicated read that you will definitely enjoy if you like your mysteries short and action filled. Some Let me begin by saying this is a very short read. It's also very fast paced and there's a lot going on! But this fast style went well with the overall story. It's just an uncomplicated read that you will definitely enjoy if you like your mysteries short and action filled. Sometimes it could have used some more details and explanations as to why certain things were happening. When Lyn and her partner questioned people about the woman who disappeared it felt like they only asked 2 questions and were on their way again. It felt a bit messy, as if they weren't really caring for the woman to be found. We also didn't get a huge amount of answers about the childhood situations that the two girls where in. But I think there will be other books in this series, so I'm guessing more answers will be given in the next books. If you write a book that's really small obviously you need to cut in some parts. It was completely filled with action and because of that sometimes the details or emotions where a bit lost. I'm the kind of person that gets easily frustrated with missing details and I'm glad that I can say it didn't really bother me so much in this book than it would have in most other books. It's written really well and because it goes so fast you don't really have "time" to look for more. The characters weren't incredible, they weren't bad. But I feel like they were a bit standard. They didn't have much depth, but they weren't badly written either. It wouldn't be bad if there was a little bit more development in the next books. I'm looking forward to seeing where this series will go to in the next books! An easy read and a great book! Ann Jones’ writing style keeps you well immersed in the depths of her story. I easily connected with the characters and found myself moved by them. I read book one straight through, already have book two and am delighted to hear there is a third! Keep writing, Ann! I loved the start of this book where a husband walks into his local Police office and reports to Lyn Kramer that his wife is missing.......but he cant get his words out properly as Lyn is the doppleganger of his missing wife! The story itself is interesting and kinda shocking, t I loved the start of this book where a husband walks into his local Police office and reports to Lyn Kramer that his wife is missing.......but he cant get his words out properly as Lyn is the doppleganger of his missing wife! The story itself is interesting and kinda shocking, there may be a couple of flaws in the story but these are overcome later on and are righted! Thoroughly enjoyed this book. Was hooked into the story from page 1, line 1, word 1. I received a copy of this novel for free from the author via a giveaway. I have voluntarily chosen to review the book, and the gifting in no way determines my review/rating, which reflects my honest opinion. This is a completely new author for me and it wasn't until I read some reviews on here that I realised Missing is the author's debut novel, which makes it all the more exceptional for that reason alone. Extremely well written, with engaging characters and a fast paced plot that holds your at I received a copy of this novel for free from the author via a giveaway. I have voluntarily chosen to review the book, and the gifting in no way determines my review/rating, which reflects my honest opinion. This is a completely new author for me and it wasn't until I read some reviews on here that I realised Missing is the author's debut novel, which makes it all the more exceptional for that reason alone. Extremely well written, with engaging characters and a fast paced plot that holds your attention from the first sentence and drags you along on a thrilling, action packed adventure. At times it was a little lacking in descriptive content and back story, but as a debut work and what looks to be the first of a new series, this leaves the avenue wide open for the author to add depth to unexplored questions in the following books of the series. I won't rehash the synopsis as the outline is there in the blurb and I generally hate giving spoilers away. I will say that I have already chosen a few characters as favourites - Jud, who comes across as the young stud muffin but seems to be wise beyond his years, and Pops because I can just visualise the crusty old bugger. I'd like to see some more character depth with Lyn, which I'm sure will develop with time - at the moment, while passionate, she seems a bit "flighty" for a seasoned cop. Oh! And what an antagonist we have in Allen. I can't wait to see what the author has in store for him and the rest of his feral family. Interesting reading about 2 sisters who were separated. Now one is missing and the other is a polie detective. Some romance but overall I enjoyed the book and of course happy end. Very intriguing read, the more I read, the more I enjoyed it. The last few chapters were very tense and exciting and loved the plot! Can't wait to read "Trapping"
This is the first novel in what appears to be a police procedural series featuring a female detective. While I found this book to be on the short side, it did set up the series quite nicely as it introduces what seems to be a complex and troubled history for the main character with lots of potential for future conflicts and revelations. For me, the characters were particularly strong: they seemed very human, for the most part. (There's one character who seems a little too perfect to me, but it's This is the first novel in what appears to be a police procedural series featuring a female detective. While I found this book to be on the short side, it did set up the series quite nicely as it introduces what seems to be a complex and troubled history for the main character with lots of potential for future conflicts and revelations. For me, the characters were particularly strong: they seemed very human, for the most part. (There's one character who seems a little too perfect to me, but it's possible that a future installment will reveal more - I'm hoping for more development there). I especially liked that the main characters all had obvious flaws. The plot moved along at a very good clip. I think it would have benefited from a longer, more detailed treatment, though. There were a couple of small details that were not explained as it pertained to the disappearance. In addition, the denouement just seemed a bit neat to me - I think there are ways to have complicated matters that would have added dimension to the story. This was, overall, an enjoyable read, and it sets up future installments very nicely. Can't put this thing down, Have not read a good book a a while... Thanks Ann, Worth the wait! I thought the story was good. It had a couple of sad spots in the story. The story had you wondering what happened to Melissa. I got to see two sides of family, one nice, and one so bad, they all need to be locked up for a long time. Lyn’s boyfriend, now a ex needs to be locked up as well. He turned out creepy to me. Lyn a detective and her partner does everything they can to find what happen to her. The author starts throwing info at me and then it seems the m First time reading from the author. The author starts throwing info at me and then it seems the mystery is all coming together. Now I am sitting at the edge of my seat going come on! Save her! Hurry up! Tears start to roll down as Melissa seems to be giving up. Now I am really yelling at them to hurry it up. Time is running out guys. That was a very good ending. I hope to read more from the author. Got for an honest review. Missing is an intriguing mystery from debut crime novelist Ann Jones. Her main character Lyn Kramer is a no-nonsense detective who has no trouble clearing cases, getting the job done, and calling it a day. And since she is so good at it, believes herself to be impervious to the crimes she investigates. Until it becomes personal. A simple missing persons case turns into a waking nightmare for Kramer, when it turns out it’s her twin sister who is missing. Because of a terrible painful past, and a long separation between the sisters, the case stirs up memories, Kramer would prefer to repress but is helpless to do so. And a very thin veil behind which the family skeletons hide is about to be drawn aside. With the help of her green yet surprisingly empathetic partner, Jud, and a few resistant witnesses can Lyn save her sister, and by doing so, save herself? Or will she just crack under the pressure? I’m afraid you’ll have to read the novel to find out. This book is a quick read with a simple yet engaging plot. The characters are real and I instantly bought the sequel because I missed them as soon as I reached the end of "Missing." It was very well written with a great story line. I just wish it had been longer. Missing follows a detective, Melinda (Lyn), who is working on a missing persons case with her partner Jud. As soon as Lyn sees the picture of the missing woman, she instantly and easily recognizes her, because it is her twin sister, Melissa. Lyn has not spoken or seen her sister since they were separated at a young age and she had no idea that Melissa was living in the same city as herself. I received this book from the author in return for an honest review. This in no way influences my opinion. Missing follows a detective, Melinda (Lyn), who is working on a missing persons case with her partner Jud. As soon as Lyn sees the picture of the missing woman, she instantly and easily recognizes her, because it is her twin sister, Melissa. Lyn has not spoken or seen her sister since they were separated at a young age and she had no idea that Melissa was living in the same city as herself. Melissa was sent to one set of their grandparents and Lyn was sent to the other when their parents died from a drug overdose. Lyn and Jud set out to find Melissa and in the process Lyn discovers some more information on her past and her family. I'll start out by saying that this book had me interested from the beginning. As soon as I read that Melissa and Lyn were twins, I was instantly questioning how this book was going to turn out. At the start, I felt that Lyn was not concerned about her sister at all. She didn't seem upset or frantic. She was just acting as if Melissa had no relation to her at all. I understand that she did not want to be thrown from the case for having a personal relationship from Melissa but she really did not show any kind of feelings about her twin sister being missing. It was also a little odd that after all these years, Lyn and Melissa had no contact or any attempts at contact. Lyn had no idea that Melissa lived in the same city as her or that she has a husband and two kids. The romance between Lyn and Jud is cute but it seemed very predictable. At one point in the book, I was actually questioning if Melissa's husband, Gary, was involved because he lied to the police about calling Melissa's work to see if she showed up. But we never did get any clarification on why he ended up lying to the police. I enjoyed this book, but it was a little soft for me. There was no real build up of suspense or mystery, the romantic sub plot was a bit adolescent and the character development definitely needs work. I guess I just expected a little more grit in a story where the protagonist is a detective. Overall, its a nice light read, and some of the characters have huge potential, especially Kelsey. If you want something thats easy to read and has a light touch with the darker aspects of life this is a good I enjoyed this book, but it was a little soft for me. There was no real build up of suspense or mystery, the romantic sub plot was a bit adolescent and the character development definitely needs work. If you want something thats easy to read and has a light touch with the darker aspects of life this is a good pick. What an excellent story! Ann Jones' descriptions with deep insights of police culture make me think at times that the author herself is a detective and that the case was real. I couldn't put down the book until I finished, feeling the human emotion of Detective Lyn Kramer when her twin sister, Melisa, was missing. Just finished reading this book in one sitting and I really enjoyed it, I can’t wait to see what’s coming next. All In all it was a fantastic read with promising characters and a great last few chapters packed full of tension! This is a well-crafted and splendidly written must read novel. The mystery suspense keeps one thinking and working with the story line. The story line is unique. It is a lovely clean book with a sprinkle of romantic promise. Grammar is first-class. I am waiting for this author to write her next book so I can read it. With her exceptional skills, she will go along way in the world of writing. “She looked up into the night sky, at the bright stars and the sliver of moon. Inside she was screaming for help, but who could help her?" Lyn Kramer is a detective just like her grandfather. Most cases are pretty typical but when Gary Farnsworth comes into her office over his missing wife she gets thrown into a case that shows her that her past wasnt what she thought it was. The missing woman is none other than her twin sister. Murder, dark family secrets and more are enough to set anyone on edge. Can Lyn and her partner solve the case in time to save her twin? Or will the dark secrets of her family consume yet another person she loves? I was invited by the author to read the first book of her Lyn Kramer criminal suspense series and I have to say I was not disappointed. I actually put down the other book I was reading to finish it. The story itself, while brisk moving, flows well. There's a lot of points here that can be fleshed out. While I dont know how any books are planned for this series, Jones sets herself up to make a fair few titles and spin offs in this particular run. The only thing I didn't care for was the abrupt end. I wanted more to read than the 191 pages it ended at. Missing had me captivated from the moment I started reading this thriller, to the very end. The only disappointment I had was it left me wanting for more and I'm hoping there will be a sequel. Ann's characters were believable and the more you read the more familiar they become to you. Lyn Kramer is a clever detective with a sketchy past and a twin sister that desperately needs her help and Lyn won't hesitate to do so to the point of putting her own career on the line. If you enjoy a thriller that Missing had me captivated from the moment I started reading this thriller, to the very end. The only disappointment I had was it left me wanting for more and I'm hoping there will be a sequel. Ann's characters were believable and the more you read the more familiar they become to you. Ann Jones is impressive with the detail in ‘Missing' a Detective Lyn Kramer story. She's able to wrap you tightly into an enthralling narrative of deception and mystery. Follow Detective Kramer on the hunt for her sister, Melissa, before her sister commits a crime to protect her family. Detective Kramer is caught between a family feud, the woes of forbidden love, and solving a missing persons case to close to home. 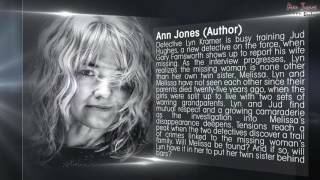 Who, what, why are great questions but without giving away the plot YOU MUST READ Ann Jones is impressive with the detail in ‘Missing' a Detective Lyn Kramer story. She's able to wrap you tightly into an enthralling narrative of deception and mystery. Follow Detective Kramer on the hunt for her sister, Melissa, before her sister commits a crime to protect her family. Detective Kramer is caught between a family feud, the woes of forbidden love, and solving a missing persons case to close to home. Who, what, why are great questions but without giving away the plot YOU MUST READ IT! Pros: Great writing, intelligent thought, and outstanding vocabulary. Cons: Predictable, cliché in some spots, and there really was no ending. I wanted to see the bust go down, so the antagonist goes to prison or dies in a blaze of gunfire. To Ms. Jones, I think this could have been a long novel with more plot twists and creative character development. Conflict, in a story, needs to keep you on the edge of your seat. I felt the tension of Jud and Lyn, the possibility of the threats by Uncle Lester, and the emotions of not seeing a sibling for twenty-five years but it could have been so much better if you expanded on missing details. 1. Maybe a forbidden romance between Detective Hughes and Detective Kramer. 2. A more extended backstory explaining why Uncle Lester did what he did other than jealousy. 3. I wanted to know more about the Barton's. What was their criminal organization like? There were missing details that needed to be expanded on like the mystery/thriller concept you were implying. 4. Lastly, A real ending to the story. Where was the big bang? I don't want the readers to be confused and think this story isn't worth reading, IT IS! Read on people and get wrapped up in Ann Jones' thought processes and superb writing craft.